You're looking at the future of space exploration: a robot who can move fast though slippery, sandy terrain. With the help of new experimental techniques, robots inspired by the one above could one day be used for search-and-rescue missions, or exploring the surface of Mars, with unprecedented speed and mobility. This robot is the spawn of a new field called "terradynamics," devoted to exploring how legs and bodies (like those of animals and robots) move through granular media like sand. "We now have the tools to understand the movement of legged vehicles over loose sand in the same way that scientists and engineers have had tools to understand aerodynamics and hydrodynamics," said Daniel Goldman, a professor in the School of Physics at the Georgia Institute of Technology, in a statement. Technically a new branch of an existing field known as terramechanics (the study of how vehicles move over terrain), terradynamics is specific to legged-movement through and over "flowable" surfaces like sand, mud, and soil – materials with both liquid- and solid-like properties. How an object like an animal's foot, or the leg of a robot, interacts with these complex materials can be even more difficult to model than its interaction with a substance like water. In a study recounted in the latest issue of Science, Goldman – along with collaborators Chen Li and Tingnan Zhang – scrutinized the motion of a six-legged robot as it traversed sandy terrain. 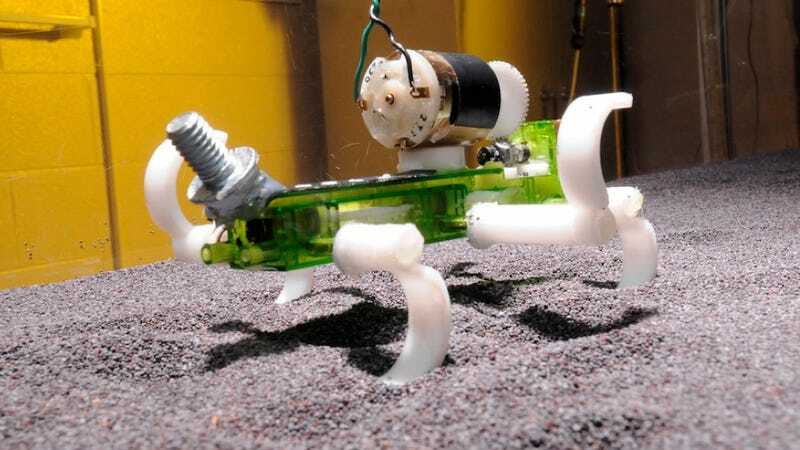 With the help of a 3D printer, the researchers created a series of legs, in a variety of shapes and sizes, and examined how different configurations and stride frequencies affected the robot's ability to scramble across the sand. We took these force relationships that we measured and we input them into a special kind of simulation called a multi-body dynamic simulation. We found that when we put the force relationships into the simulation, we could predict the robot's speed to a few percent over a pretty wide range of conditions of leg geometry and granular material. Using his team's novel technique, Goldman thinks "roboticists and engineers who are interested [in designing] vehicles that can move in loose, granular material... can immediately begin to optimize limb shapes and limb trajectories for small robots." In the past, approximations based on old-school terramechanical models have led engineers to over-predict the speed at which small, wheeled vehicles (like the Mars rovers) traverse sandy terrain. A new terradynamic paradigm, focused specifically on legged locomotion over flowable surfaces, could help address the shortcomings of these outdated models, while ushering in a new era of investigational robots – whether they're used for search and rescue here on Earth, or exploring the surface of another planet. "We think that the kind of approach we are taking allows us to ask questions about the physics of granular materials that no one has asked before," said Goldman. "We are at the beginning of tools that will allow us to do the design and simulation of legged robots to not only predict their performance, but also to optimize designs and allow us to create new concepts." The study is published in the latest issue of Science.